I’ve been stewing for a couple of weeks. stew: to undergo cooking thinking and pondering, by simmering or slow boiling. I am not a country music fan but I am familiar with the lyrics by Aaron Tipton, You’ve Got to Stand for Something or You’ll Fall for Anything. If you’re familiar, you can guess where I’m going. And, I’m going with great trepidation but because I’ve allowed my heart and my thoughts to simmer and slow boil for many days now, I’m ready to dish it out!!! To know that you know you are a blood-bought child of God and are filled with His Holy Spirit who will teach you all things. To rightly discern Holy Scripture (it is the same today as it was penned 2000 years ago). To have the courage of my (your) convictions. To have an enduring spirit. To rise up and have a voice. Contrary to what the world says, Everything isn’t good! There are things that are just plain bad! Things that are unholy. Things that are blasphemous. We must be bold to stand against those things. The Word is clear, 1 Peter 5.8 states, Be sober, be vigilant; because your adversary the devil walks about like a roaring lion, seeking whom he may devour. Y’all, Peter wasn’t using hyperbole when he wrote that – of all folks who knew the sly, sneaky schemes of the devil, Peter did! Just because everyone is doing such and such. Just because SCOTUS says, “It’s okay.” Just because they are teaching it in school. There are certain things THAT ARE NOT RIGHT, THEY ARE CONTRARY TO GOD’S WORD and we must learn to stand against them. 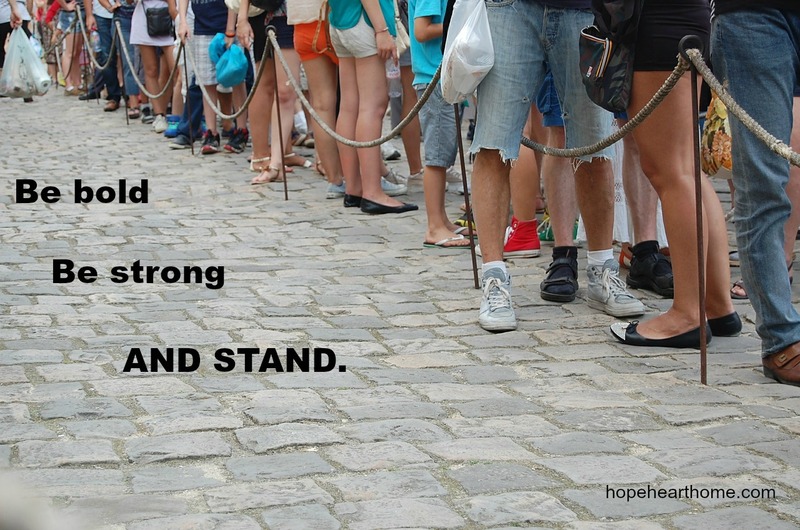 I think people need to be encouraged TO STAND rather than reminded to love. NOT to say we aren’t to LOVE – of course we are – Jesus Christ, our example, loved without condition but He also called things as they were. He loved, He gave reproof, and He instructed, Go and sin no more. He did not say, If it feels good, keep doing it. He did not say, If it feels good, keep doing it. I pray you see my heart in these words and you hear my deep yearning for all of us, who bear His name, to stand boldly and with a great courage of conviction to not waiver on The Truth of God’s Word. If my words have not turned you away and you want to be encouraged to stand, please click on the scriptures below and encourage yourself via Bible Gateway! It is my whole heart’s desire TO STAND – will you stand with me? Standing for truth and stooping for grace – PERFECTLY expressed. To be honest, I believe we have entered (been in?) a time when we must stand on scripture as never before. What that is going to cost those of us who name the name of Christ as our Savior & LORD remains to be seen. As I was saying to a friend recently, “we better – we Chistians – better have their roots down deep” in the Word and our commitment to the LORD because what we are going to face things we’ve never had to face before. We need a strong word in this time. Thanks Sus. Dolly, God asks us to do hard things – o! for grace to be brave. I’m so glad you shared this. Especially if you know the Lord has put it in your heart to speak up. I have such a hard time worrying too much about what others think. I loved what you said about “I have no intention of being politically correct with my words today – or any day for that matter…what I do want to be is spiritually correct.” Amen! Natalie, let’s stand together and give each other courage! As you said, there are things that ARE JUST PLAIN BAD and there are things that are RIGHT. If those of us who believe that the Word of God is truth and tells us what those things are don’t stand, how will those around us ever know. Loving is caring enough to let them know, especially our children who are bombarded with what isn’t good everyday. I fear for the next generation raised in a world where truth is relative and changes every day according to popular opinion. Who will tell them what is RIGHT? Who will tell them what is right? I am standing. I will speak truth. Tired of always backing away or shutting up. I will stand on the fact that life begins at conception and ends when God decides it ends not us. I will stand on the fact that marriage is between a man and a woman. Sometimes it is necessary to say It all isn’t good. I will not be politically correct. I will say ah — no. 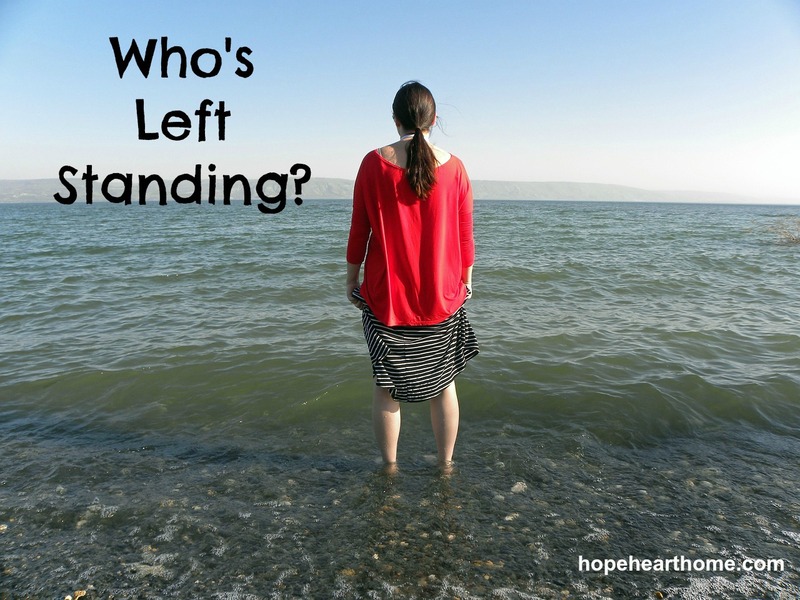 Sister, I think it’s time to rise up and stand on truth and stooping in grace – like Katie said. I’m so thankful for the gift of God’s grace. Grace is wonderful and we need GRACE TO STAND. Standing firmly with you Susan! Thank you so much for sharing. Ah, Lucy Parker, so good of you to visit!!!! You are an EMPATH…remember? I love you exactly the way you are! I whole heartedly agree with what you said and how you presented it. I feel when we discuss the actual facts of what is going on we are giving the Devil glory. Knowing the word of God and presenting it is the key, say it in love and that’s all that needs to be said. If ALL Christians would stand together what power that would be. Carol, WE will stand together. Such a timely and needed word. I don’t have an ounce of p/c in me…..I just cannot do it. I DO temper my words at times, but, never to the extent of compromise. This most recent issue (and when I saw “The People’s House” (aka the White House) bathed in rainbow lights I didn’t know whether to scream, cry or throw up)…….is “forcing” people to decide “who is on the Lord’s side”. There are issues that are so plainly sin and this is one of them. God’s Word is clear and we must be clear as well. Thank you, Susan. I’ve never known you to be PC, my outspoken friend!!! I saw this post yesterday and left it open in a tab overnight because I wanted to make sure that I came back and read it again this morning. This hits home with me — and you know the reasons why — but the fact that I struggle because of my family situation only makes it more important to stand, I think. Thanks. I think you did good work for the Kingdom here and I know you did good for me. Shelby, I thought of YOU when I hit “publish” – I cannot know how sensitive this issue is for you, but I do know that we must love, love, love and offer grace all the while standing. God will give you the grace to do it well. Thank you so much for sharing your heart. I agree that we are first and foremost called to love God and love others which takes a great deal of pressure off of all of us to judge, but there is also a great need for all of us to stand up for what is right/holy/good in the eyes of God. We never have to agree with anything going on in our world and yes, we have to take a stand for His word and His truth, but I do believe that our only job is to love. I love your passion and your writing speaks to me so clearly!